Yes, the title is another one of my terrible puns and, to be honest, I wanted to use something related to CAD and CAM but couldn’t get anything to fit so that’s what I was left with. Perhaps a better title would be ‘The pen is mightier than the mouse’ but regardless the focus of this week’s blog is the fact that drawing skills as a means of developing ideas and communicating seems to have fallen out of favour with preference being given to shiny new CAD software in schools, but in industry it seems to be the other way round. I grew up in a time of great technological change when we had just 3 TV channels and texting your friend involved biking around to their house and knocking on their door. I witnessed the launch of digital media, computers and video games, home video and even the birth of the internet. I followed a very traditional route through art and design education but, when I got to university, the shiny Silicon Graphics machine standing tall and magnificent like a glowing monolith in the computer technology department was simply too much to resist and I was hooked. For the next few decades I became obsessed with 3D modelling, interactive media, virtual realities and computer graphics animation. However, I have witnessed such technologies reach a zenith (for the time) before plummeting to a nadir. Virtual reality died under the pressure of no suitable technology, CGI gave us the ground breaking Toy Story but that same technology now churns out forgettable summer movies and Saturday morning kids TV. Video games diluted down to collecting coloured jellies on your smartphone and CAD is now used by 5 year olds on their iPads. What this inevitably means is that a technology once considered highly skilled is now little more than a fun app and part of everyday life. Consequently, those once considered almost elite in their fields with roles commanding 6 figure sums are now paid less than teachers…if you can believe that. Allow me to give you an example. I currently work as a furniture designer for a luxury motor home company where vehicles can exceed £600,000 in price. My role involves designing interiors and furniture for the new model range but is very hands on with a great deal of R&D, prototyping and bench building of said prototypes. To do this I am using Solidworks which is state of the art CAD software for the professional market. It costs thousands yet it is seen in this role as little more than a tool which anyone can be trained to use. ‘CAD jockeys’ as they are known are simply thought of as skilled workers much like the fitters and plumbers on the factory floor; some are even joiners and fitters given a few weeks training. However, designers appear to have a little more credibility as they actually ‘design’ the stuff that the CAD jockeys turn into parts and assemblies. But the thing that has really impressed my boss and the marketing people in the firm is the fact that I can draw…with a pencil…maybe a few markers too. 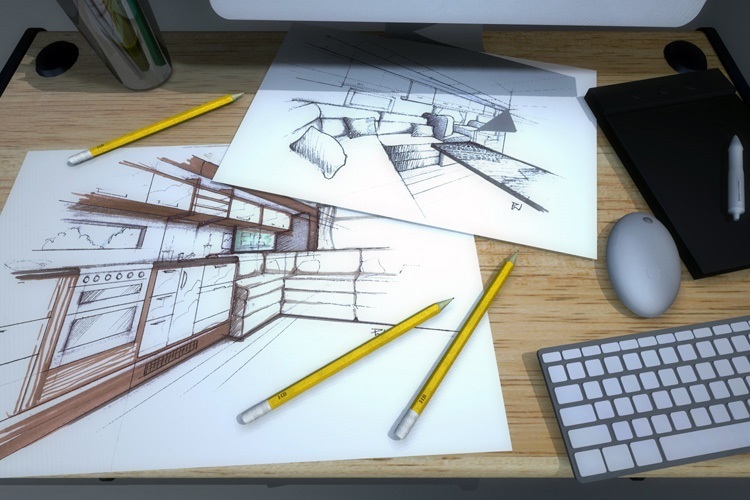 It’s unbelievable to me that a skill, or talent if you prefer, that I simply took for granted and discarded in favour of shiny new CAD software has people cooing over simple pencil and pen sketches in a sketchbook. It’s not just my workplace either, at a recent Motor Show in Dusseldorf I spent several days looking at motor homes that resembled luxury yachts on wheels. One even had a lift underneath where you drove in your Porsche only to watch it ascend on hydraulics into the built under garage!! Despite all this glitz and glamour the stand that seemed to draw a great deal of attention was one where the walls were covered in hand drawn sketches of the design interiors. They were fantastic yet simple with an assured confidence that only a seasoned designer can produce after years of practice. I watched as people walked casually past much of the technology on show only to stop and stare at these drawings usually with a wry smile before pointing it out to their friends or colleagues. Simply put, drawings not only have the power to communicate ideas quicker and more clearly than increasingly complex CAD models, they have a genuine attraction which is often hard to explain; they communicate with us on a level we simply accept. Additionally, in a world of shrinking budgets, the D&T classroom can still stretch to a bunch of pencils. Unfortunately, when you are young, it’s still the shiny CAD and CAM equipment which impresses which sadly means that simple drawing skills are often under developed and I have even worked alongside D&T teachers who simply cannot draw and jokingly admit to it. Every day I sit in front of an expensive CAD workstation but I always ensure that I have my sketchbook, pen and pencils with me and, so far, they have proved far more valuable in communicating ideas and concepts than the state of the art CAD software. Admittedly, once the design work is done, then CAD comes into its own in ensuring those ideas can be modelled and produced accurately but let’s stop plopping kids down in front of CAD software if they can’t produce a simple drawing first. It’s a skill they will make genuine use of regardless of their career aspirations. You never know when the computers will stop working and those that do go on to creative careers will no doubt thank you down the line for ensuring that they develop that most cost effective, pervasive and universal method of communication.